Number one, “It’s too reverberant!” The complainants give various descriptions (echo, flutter, etc.) but they all boil down to “It’s too reverberant!” And number two, “The HVAC (heating, ventilation, and air-conditioning) system is too loud!” They use a public address system for the play, speaker, or whatever the event, but all they end up with is loud, unintelligible speech. Like many problems, these acoustical issues are more difficult and costly to address after a building is constructed than during the design stage. Excessive sound reverberation may not be a problem during sporting events, in fact it may result in a louder, more exciting event, and it may not be problematic during school concerts, but overly reverberant spaces degrade speech intelligibility and will harm speaking events. The solution is simple, incorporate enough sound absorbing finishes into the gymnasium as are needed to avoid excessive sound reverberation, most often quantified by the Reverberation Time. Answering the questions “what”, “where”, and “how much” is where an acoustical consultant can benefit the project. It is best to not wait until the project is constructed, when walls are painted with designs that would have to be covered, when ceilings have fire suppression systems and light fixtures that will interfere with the addition of acoustical finishes, and when some abuse resistant finishes such as acoustical metal roof decks are no longer options. Loud HVAC systems are less of a problem for speaking events, when a public address system can be used to overcome the HVAC noise. 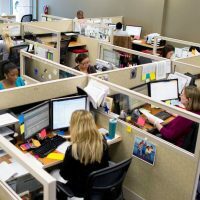 Loud HVAC noise, however, is more of a problem for team practices and physical education classes, during which the noise can hamper communications between the coach or teacher and the students. Coaches and teachers will find themselves talking more loudly, or outright yelling, to overcome the noise of the HVAC system. The teacher who must spend many hours every day in this environment may strain his or her voice. Attenuating HVAC system noise is even more difficult post construction than correcting sound reverberation problems. There are several possible causes of loud mechanical systems noise. Mitigating it may require placing acoustical duct lining in the air ducts, modifying the ductwork to accommodate duct sound attenuators, increasing the size of ductwork to reduce air velocity, changing duct layout, using different supply air diffusers, relocating air dampers, installing better vibration isolation under the air-handling units, relocating the air-handling units off of the gymnasium roof, or not suspending the air-handling units within the gymnasium itself… many possible problems and solutions, most of which are much easier to avoid during design then to correct after installation. And that’s why architects come to us time and again to help design acoustics and noise control for gymnasiums – because we make sure these problems never occur. You know, I have to tell you, I truly savour this webpage and the informative insight. I find it to be energizing and very informative. I wish there were more blogs like it. Anyhow, I felt it was about time I posted a comment on Problems with gymnasium acoustics, echo, and reverb? 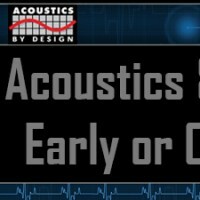 How to make things work… | Acoustics By Design Blog – I just wanna tell you that you did a good job on this. Cheers dude!